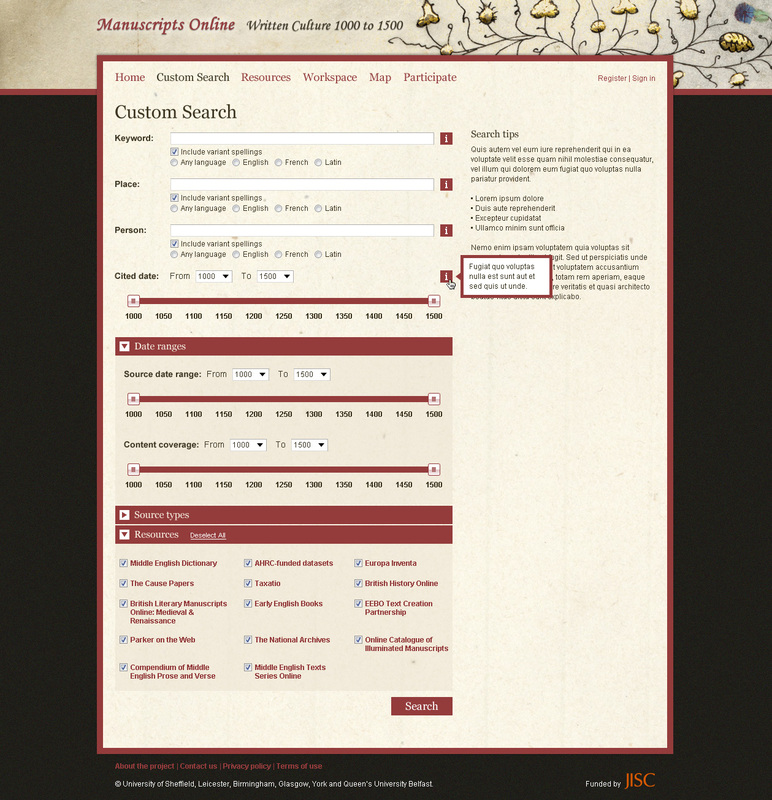 ≈ Comments Off on Manuscripts Online is Live! 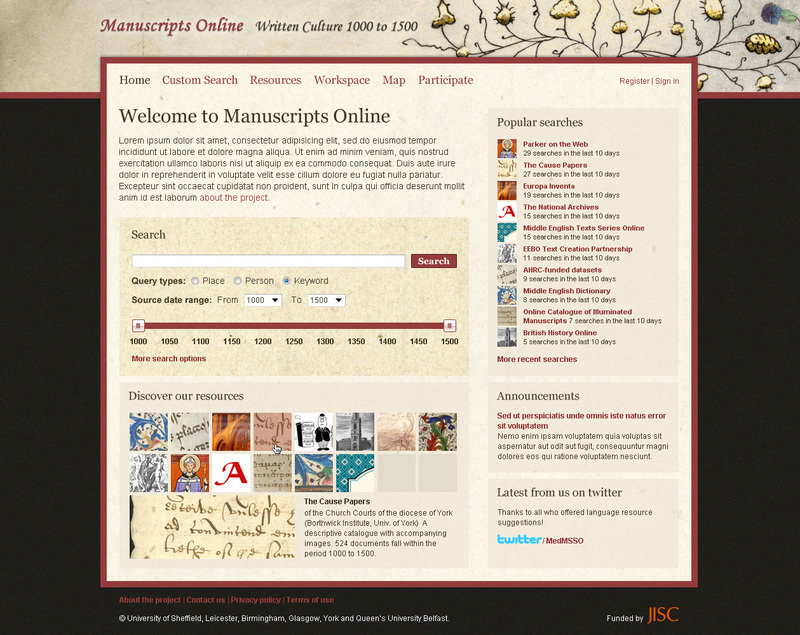 Manuscripts Online has now been officially launched. We hope you’ll like it! 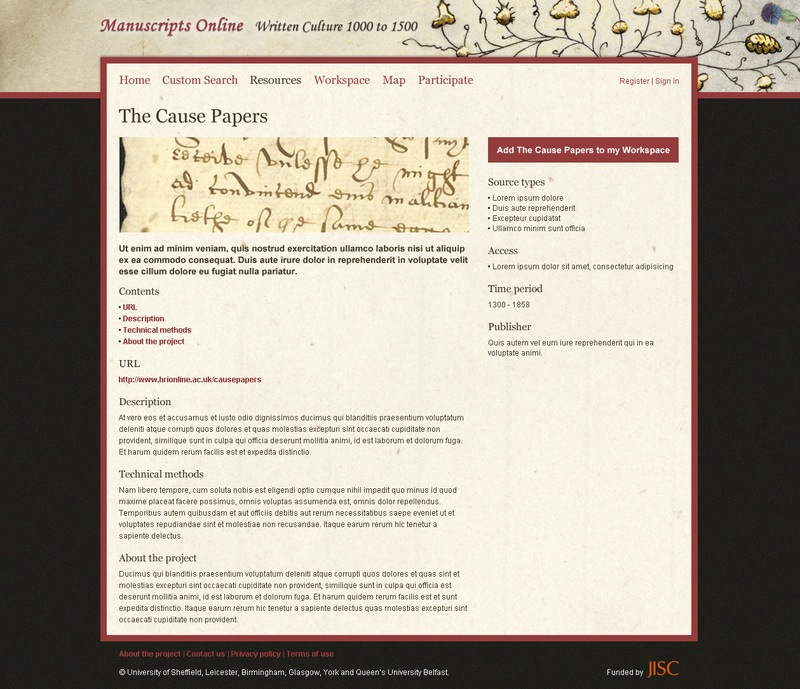 Registration is now open for ‘Manuscripts Online 1000 to 1500: Exploring Early Written Culture in the Digital Age’, a one day conference to be held on 11 January 2013 at the University of Leicester to celebrate the conclusion of the JISC funded project Manuscripts Online https://manuscriptsonline.wordpress.com/about/. We have two internationally acclaimed plenaries: Andrew Prescott (King’s College, London) and William Noel (University of Pennsylvania). Papers will explore the significance of our approach to data mining and federated searching to manuscript studies and early written culture. Speakers will also talk about the value and benefit of the project for teaching and researching early written cultures, and discuss how the resource, which is created by the project, is an opportunity to explore different techniques and approaches across disciplines. We are aiming to build in plenty of space for participation/discussion. Information about the venue and on how to register are available on the Conference website https://swww2.le.ac.uk/departments/english/news/conferences/manuscriptsonline. Registration, lunch and refreshments are free, but please register using the online form by 3 January 2013. Places are limited, book early to avoid disappointment. On Thursday afternoon, there will be a workshop on the Manuscripts Online Project. Delegates will be asked to interact with the newly developed website and carry out specific research tasks. Delegates will help to shape the final technical development of the project. 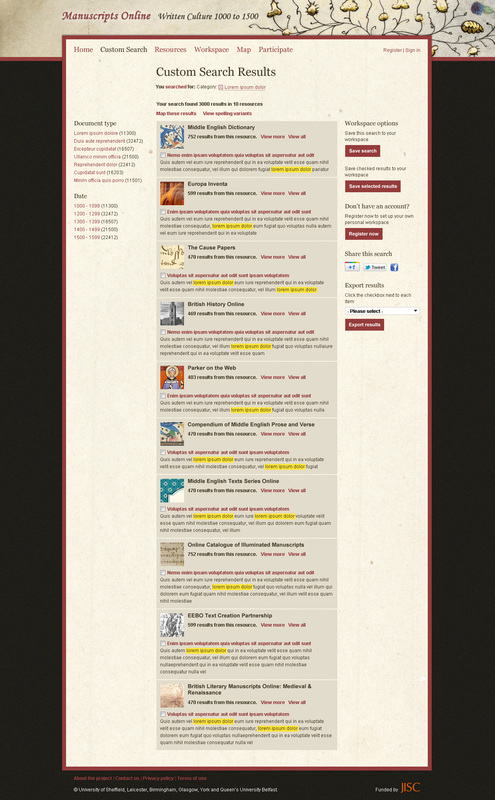 Registration is now open for Quadrivium VIII, which will be held at the HRI University of Sheffield, 1-2 November 2012 under the auspices of Manuscripts Online (https://manuscriptsonline.wordpress.com/about/). For those of you who are new to the PhD, the Quadrivium programme offers lectures, seminars, and networking opportunities over a two-day period to postgraduate students who work on medieval textual cultures, and will be of value to research students at various stages of their doctoral careers. The programme is a collaborative training event run by medievalists at Birmingham, Queen’s Belfast, Oxford, York, Leicester, Glasgow, Sheffield and St Andrews. This year Quadrivium will focus on digital humanities and their value for postgraduate research, including an hands on workshop on the new project ‘Manuscripts online’. There will also be sessions on academic and non-academic careers, workshops on grant applications and other ‘generic skills’ sessions. A full programme will be posted on the symposium website soon. Quadrivium VIII is generously subsidised by JISC. Registration for Quadrivium is free, and lunches and the conference dinner will also be offered free of charge. We are also pleased to offer financial support to cover accommodation and travel expenses which will distributed on a first come, first serve basis (on production of receipts). Students will be informed promptly whether funds are still available. These are the latest versions of the five main designs for the MSSO website. Please feel free to leave feedback (but remember, this is purely for the visual design – text is (mostly) there for display purposes only). The report from our focus group on 29 February is now available at the Documentation page. I’ve also posted the three test homepage designs used for the focus group there – if you’d like to leave additional feedback (in comments below), that would be most welcome. This will be on the agenda at our project/Advisory Group meeting on Friday! On the 16 and 17 of February, the project team participated to Quadrivium VII. This is “an annual training event, run by postgraduates and academic staff and designed to offer UK and Eire postgraduates doctoral research training in the area of medieval textual studies, both in generic graduate attributes and in specialised research skills”. It was an excellent event which covered practical advice and skills for postgraduate students. The team put together an enticing programme which covered a wide range of issues of interest to the students’ community and beyond. The event started on Thursday with the Academic Careers panel. The panel focused on the opportunities for careers within academia following a PG degree. Facilitated by Dr. Alison Wiggins and Dr. Ryan Perry, the discussion covered the routes available to early career researchers and offer practical help and advice on the subject of post-doc applications. An evening lecture by Linne Mooney on London medieval scribes and they work on literary manuscripts concluded the day. The CV Session was led by Prof. Carole Hough. Students were asked to bring their own CVs to the workshop where they will receive advice and feedback. The session was stimulating and the discussion showed how important it was for the student to think about how to present themselves for different types of job applications. The day ended with a spectacular visit at the University of Glasgow’s Special Collections where Glasgow University Library staff Sarah Hepworth (Assistant Librarian) and Robert MacLean (Principal Library Assistant) showcased some of the treasures held in the library. The two day event also hosted the Manuscripts Online first focus group in which participants were asked to fill in a questionnaire about their perceptions and opinions towards the design of the Manuscript Online web site. These questionnaire informed the the preliminary visual designs for our second focus group in Birmingham. Thank you to the participants for their enthusiastic response! And thank you too to Prof. Jeremy Smith, Joanna Green and the team for putting together such an interesting event. Looking forward to Quadrivium VIII in Sheffield in November 2012. Can you help us? 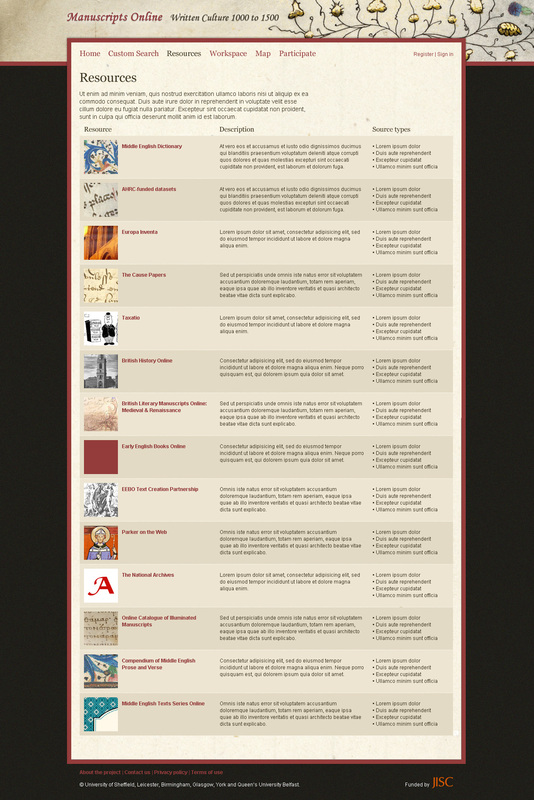 We’re looking for digital language resources for Latin (especially Medieval Latin), Anglo-Norman French, and Old and Middle English. We’re also aware of the Dictionary of Medieval Latin from British Sources, but not sure how far advanced that project is. We’re not just looking for ‘proper’ dictionaries; basically, we really need word lists, especially common spelling variations. To be usable, resources must be in a structured text format and free to use. Ideally, we’re looking for a database or tagged XML, but as long as there’s some sort of regular structure (eg an HTML table or list) it may be useful. They don’t necessarily have to be available online. But we can’t use PDFs or scanned images. We will be very happy to obtain any necessary permission from resource owners and give them credit when the project launches. All help will be gratefully received!